Karen Forman constantly needs something from the grocery store. Milk, bread or a movie. Renting movies has never been more convenient, cheap or ubiquitous. Andrea Gorno, of Johns Island, rents a movie from the Redbox kiosk in a Harris Teeter supermarket in Mount Pleasant. Gorno returned one movie and decided to rent another, saying the $1 price and convenience of being able to return DVDs at any Redbox vending machine are a plus. Redbox, the $1 do-it-yourself rental machine the size of a refrigerator, offers DVD movie renters convenience at a place people visit all the time: the grocery store, among other places. "It's right there," Forman said as she dropped off a movie at Harris Teeter in Mount Pleasant on her way home to downtown Charleston. "You don't have to make another stop." For $1, customers swipe their ATM card and can take home the latest new releases, such as "Gran Torino," "The Da Vinci Code" or "Valkyrie." There's even something for the children in the automated kiosk. The latest "Scooby-Doo" and "Spider-Man" animated DVDs are right there, too. Redbox operates more than 15,400 kiosks throughout the United States — Blockbuster Inc. has just 50 — and Redbox plans to introduce about 5,000 more by the end of the year. Each machine holds as many as 700 DVDs and 200 movie titles. And they are not just at supermarkets. They are popping up at drugstores, restaurants and convenience stores. You will find them at Wal-Mart, Walgreens and McDonald's, for instance. "We are in locations where consumers are already shopping," Redbox spokesman Chris Goodrich said. "We are saving customers that extra stop." An added bonus is that DVDs don't have to be returned at the same place they were rented. Andrea Gorno of Johns Island can attest to that. On her way to drop off her boyfriend at work in Mount Pleasant last week, she stopped by Harris Teeter to deposit a DVD they rented over the weekend on James Island. She also selected another one. "It's very convenient, and it's cheap," she said. Customers rent a DVD from the machine using their ATM cards, which enables Redbox to charge an additional day's rental if the DVD is not returned within 24 hours. If a DVD hasn't been returned in 25 days, the charges stop and the customer owns the DVD. A typical kiosk can earn quite a haul: about $50,000 annually in revenue per machine in operation after three years. Blockbuster plans to roll out about 3,000 DVD vending kiosks like this by the end of the year to counter Redbox's surge into the movierenting business. "We have grown at a phenomenal pace over the last six years, and that growth is continuing even in the midst of a recession," said Gregg Kaplan, who led Oakbrook Terrace, Ill.-based Redbox Automated Retail from its inception until April, when he became chief operating officer of its parent company, Bellevue, Wash.-based Coinstar Inc. "We're not seeing anything that's slowing it down." Coinstar, which owns Redbox as well as the smaller DVDXpress found at such places as Bi-Lo, saw DVD revenues in its first quarter of $154.7 million, a 156 percent increase over the prior year's same quarter, Goodrich said. "The success isn't recession-driven, but it has raised the tone of success," he said. "When the recession ends, Redbox will still be very popular." Goodrich downplayed concerns that the company might be growing too fast, saying market studies show just 20 percent of the population is aware of the brand. "There is great potential for growth," he said. Not to be outdone, Dallas-based Blockbuster, which normally charges about $4 per movie rental in its 4,000 U.S. stores, starting rolling out its own DVD-vending machines recently and has 50 kiosks in its home base and Oklahoma City with plans to add 3,000 more elsewhere by year's end. "We hope to significantly increase our presence," Blockbuster company spokesman Randy Hargrove said. Where those new 3,000 DVD Blockbuster Express units will be still is up in the air. "We are working with NCR to deploy the vending machines," Hargrove said. He hopes to put them at convenience stores, supermarkets and drugstores, but they won't be sitting beside Redbox machines. "You will not see competing vending machines at the same location," he said. "Given the projected growth, there are opportunities to put them in different locations (from Redbox)." The pricing might be different, too. "It could vary with market demand, but it will be competitive with what's in the marketplace," Hargrove said. Hargrove doesn't see Blockbuster's DVD move as playing catch-up to Redbox. He views the DVD kiosks with more unit capacity than competitors' machines and the likelihood of additional features such as DVD and video game sales as another outlet to the company's mortar-and-brick buildings. Like Redbox rentals, Blockbuster Express DVDs can be returned to any Blockbuster kiosk. Movies rented at the Blockbuster store still will have to be returned to that specific brick-and-mortar location. Blockbuster is taking the threat from Redbox seriously and has developed a three-pronged approach, he said. It hopes to enhance its core rental business through the new kiosks, grow retail sales in stores and embrace new forms of digital delivery. Even Netflix's DVD-by-mail service has taken note of Redbox's challenge. Netflix's cheapest mail-order plan costs $5 for two movie rentals in a month, and it grew at a much slower pace than Redbox, with first-quarter revenue rising 21 percent to $394 million. "By the end of the year, kiosks likely will be our No. 1 competitor," Netflix CEO Reed Hastings said. "There are already more kiosks in America than video stores." The discount DVD-rental business worries Hollywood studios because they fear it is undercutting DVD sales, which dropped 13 percent in the fourth quarter and were projected to fall at least an additional 6 percent in the first quarter, according to analysts. In recent years, DVD sales have been the means for studios to earn a profit on movies because ticket sales are barely enough to offset production and marketing costs. Some studios think consumers will forgo buying DVDs if they have a cheap rental option. "You could make a bit of an argument that rental is cannibalizing (DVD purchases), especially in a recession year, where everyone is watching their nickels," said Tom Adams, a video-industry analyst. In the early part of the decade, when DVD sales were booming, Hollywood paid little attention to Redbox. The company was owned by fast-food giant McDonald's Corp., which saw in the fragmented vending-machine industry an opportunity to bring the consolidation and conformity it brought to burgers, fries and shakes. Redbox kiosks offer a wide array of movies such as these at a vending machine in Harris Teeter in Mount Pleasant. The machines are sprouting up in supermarkets, convenience stores and drug stores. Market testing by McDonald's in 2004 showed that consumers were willing to use the vending machines as a cheap and quick alternative to the video store. The kiosks caught on, especially in supermarkets. The consistent flow of customers and the convenience of renting a movie while shopping to fill the cupboards proved advantageous. By the end of 2005, Redbox reported that it was renting more than a million DVDs a month out of 1,200 locations. "It's a regularity of traffic, and the biggest single place people are going after the supermarket is to their homes," Redbox's Kaplan said. "Consumers tend not to rent DVDs when they're not going home." McDonald's ultimately sold Redbox to Coinstar Inc., an operator of coin-counting machines, coin-operated games and kiddie rides. Coinstar's strong relationships with supermarket operators soon had the Redbox kiosks springing up in chains such as Albertsons, Walgreens and even Wal-Mart, which accounts for 40 percent of DVD sales. Video-industry analyst Adams estimates that the kiosk rental market, which totaled $519 million last year, will reach $1.4 billion in five years, or about one-fourth of Blockbuster's 2008 revenue. "You could view that as directly competitive" with Blockbuster, Adams said. "It's a cheaper option, and during a recession, people embrace it." COMMENTARY: What goes around, comes around. I can remember when many thousands of small, independently owned video rental stores went out of business after Blockbuster came on the scene. Blockbuster was the darling of Wall Street and just could not be stopped. They became the 800-LB Gorilla, and everybody had to go to them to rent a video. Fast forward to June 2009, and RedBox appears to have distribution channels locked in. 15,000 red boxes in major grocery chains throughout the U.S. What a fantastic idea, incredible strategy. People go grocery shopping just about every day or at least two or three times a week. The convenience of renting a DVD for ONE BUCK after checking their groceries is just too inviting to turn down. I am glad that Blockbuster is finally taking it in the rear. NetFlix is also feeling the pain. I love those red KIOSKS. Thank you RedBox. And cheap too!! NEW YORK -- As consumers get ready to celebrate July Fourth, many merchants already have dismissed summer as a washout. Macy's flagship store has racks of summer tops, swimwear and dresses marked down as much as 50 percent, while luxury retailer Bergdorf Goodman is slashing prices on designer goods by as much as 70 percent. Meanwhile, piles of clothing as well as barbecue grills, tents and gardening tools are bypassing stores and heading straight to liquidators as merchants try to conserve their cash. Such deep discounting so early in the season is great news for bargain hunters, but it's a worrisome sign that shows a further weakening in retail sales since the end of May. Consumers' confidence in the economy, which had surged in April and May, is projected to be virtually unchanged for June when The Conference Board releases figures today. Though unusually rainy weather across a broad swath of the country has slowed business, some analysts wonder whether shoppers are waking up to the harsh reality that the economy won't be getting better anytime soon. BMO Capital Markets analyst John Morris estimated that the volume and size of discounts for mall-based apparel retailers he tracks is 10 percent higher than last June even though inventory is down 20 percent. "It's the economy, not the weather," said Ahmed Youssef, a 28-year-old junior engineer from Jersey City, explaining why he has stuck to only necessities like groceries at Wal-Mart and computer accessories such as an $80 hard drive at Staples. Pam MacWilliams, a tourist from Oshkosh, Wis., who on a recent Thursday was planning to scour for bargains at H&M's midtown Manhattan location with her two girls, said she's becoming less optimistic about a quick economic recovery. "I thought that the economy would turn faster," MacWilliams said. "I had high expectations. Now, I want to save more." Employers are still cutting jobs -- although at a slower rate -- and home prices are still falling, and now Americans are seeing a three-month stock market rally stall. Consumers' confidence in the economy has been rebounding since February, fueled in part by the stock market rise. But that improved mood hasn't translated into much relief for merchants because confidence levels are still well below the measure that's considered healthy. Nor were Friday's government economic reports comforting to merchants. They showed that households used most of their government stimulus payments to boost savings to the highest level in more than 15 years in May, instead of splurging at the mall. "There was a lot of hope with the surge in confidence," said Dennis Jacobe, Gallup's chief economist. He added that consumers were convinced that the second half would be better but he noted, "you can live on that hope for only so long." PARIS (Reuters) - Advertising on mobile phones should really take off within two to three years, driven by new applications on smartphones and the growing popularity of social networks such as Facebook. Executives, who attended last week's Cannes Lions 2009 ad festival, told Reuters that emerging economies were also promising though the lack of a global mobile phone standard could be a brake to speedy development. As more consumers embrace new technologies and devices such as smartphones, personified by Apple's iPhone, mobile advertising is seen growing at an annual average of 45 percent to reach $28.8 billion within 5 years from a current $3.1 billion, according to Ineum Consulting. "We have launched many mobile campaigns for the first time in the last three months. New people are coming in every week," said David Kenny, Managing Partner at VivaKi, the digital arm of French advertising group Publicis. Social networks such as Facebook, which were becoming "increasingly mobile," and applications for the iPhone would be key drivers, he said. "If you are interrupted every two minutes by advertising, not many people want that. The industry needs to work out smart and clever ways to engage people on mobiles," he said. Scott Howe, corporate vice president of the advertiser and publisher solutions group at Microsoft, predicted that mobile phone advertising will account for 5-10 percent of global media ad spending within five years. Mobile advertising was likely to attract interest from a niche of advertisers, such as small "mom and pop" local retailers which did not routinely embrace the mainstream online advertising, he said. These advertisers could shift their ad budgets away from local newspapers to mobiles for local highly-targeted campaigns. Emerging markets such as Latin America or Africa where "people probably have a mobile device before they have a wired PC," looked promising, he added. As advertising campaigns become increasingly global, the lack of compatibility between 3G phone networks in Europe and in Asia could however be a hurdle. "We have to have a common system and the technology has to have enough bandwidth for delivering the message," said Martin Sorrell, the chief executive of WPP, the world's largest advertising group by revenue. The LTE or Long Term Evolution standard, if it is widely adopted for new 4G high-speed mobile technology, could be a solution. But 4G is not expected to hit the mainstream before the middle of the next decade. COMMENTARY: What? another mobile advertising forecast. Now we’ve learned Yahoo is going to kill Maven Networks instead, the most recent in a long series of deadpooling of products and services by the Sunnyvale Internet behemoth. A tipster, who works for a large media company, tells us that he has been a Maven customer for years and was informed last week that Yahoo will cease all development on the platform and will no longer be supporting it in 2010. We’ve confirmed with another source that Yahoo has effectively decided to shelve Maven, firing most of its employees in a move packaged as a restructuring and has already notified customers that the product will no longer be supported as of next year. Furthermore, the source tells us that the Maven technology has never even been used for Yahoo’s own video properties, underscoring why the quote I lifted from the press release in the first paragraph of this post sounds so void today. “Since acquiring Maven Networks in 2008, Maven has played an important role in our video strategy, providing essential talent and core technology that has helped Yahoo! to enhance its consumer and advertising offerings. Maven technology is used in the Yahoo video player, as well as in the Yahoo Video Advertising Platform that is being used to serve both on- and off- network advertising for Yahoo! partners. Yahoo also said that the rumor about the Maven team being mostly laid off is inaccurate. There’s always the possibility that the platform will eventually live on under different ownership of course, but rest assured that competitors like Brightcove , Ooyala and KIT Digital are currently celebrating over the news. This is the third video property Yahoo has killed off in less than 8 months, after shutting both Y!Live, a live video streaming service, and Jumpcut, an online video editing tool. Remarkably, Yahoo CEO Carol Bartz recently declared on stage at a conference that the company is actually still interested in acquiring startups in the business of digital video technology. One month and the shuttering of a $160 million video technology acquisition later, it’s close to comical reading those words again. Then again, Yahoo’s prospects and financials at the time the acquisition was made sure looked a a whole lot better than they do today, so maybe it’s just too easy to judge the move in hindsight. Either way, Maven Networks is now a member of the deadpool club, although there’s always the possibility of Yahoo selling off Maven to someone who wants to revive it. COMMENTARY: While doing some research for a former client in the online media content arena, I came across Maven Networks. The news that Yahoo! had purchased Maven Networks for a reported $160 million, is again, another example of over-valuation exhuberance that has gripped the digital world. Just yesterday I posted an article that Microsoft was unloading Razorfish, one of the top five digital ad agencies in the world. The price tag is $1 billion. However, Microsoft paid $6 billion for eQuantive, which is the holding company for Razorfish. The business model that works appears to be member submitted content that you see on YouTube and other video sharing sites. Content providers are struggling, and the whole market has become a commodity, with nobody really making any money. I can remember Maven Networks bragging about how many online networks they operated and were right behind YouTube in total daily traffic, if you added up all their sites. Pooh, pooh. If you don't make money, you go out of business. Added into the mix are original content providers like ESPN, Fox Sports, CNN, Fox News and others that have huge inventories of original content which they have decided to monetize on their own. Why would you unload your content to a digital content provider like Maven Networks or Brightcove? This is another example of the shake-out in the digital content arena. Will Brightcove be next? The Guardian has some interesting stats about Twitter, which were disclosed by Evan Weaver, Twitter's lead engineer in its services division, who gave a talk at QCon 2009. -Only 20% of Twitter's traffic comes through the Twitter Web site; the other 80% comes from third-party programs on smartphones or computers. This means that if you're looking at only twitter.com generated stats on your Web site, you may be underestimating the source of that traffic by a factor of five. -During President Obama's inauguration in January, more than 300 tweets per second were being added to the message queue. Starbucks Coffee Company (Nasdaq: SBUX) delivers a new, delicious approach to food today. Looking to improve the taste of its food and focus on real, wholesome ingredients, Starbucks simplified many of its recipes and baked in authentic, high-quality ingredients like whole grains, Oregon blueberries and Michigan cherries. "Starbucks customers have been telling us that they want better tasting and healthier food options when they visit our stores. We answered their call with a delicious new menu of food made with real ingredients and more wholesome options. Whether they are looking for their morning breakfast, nutritious lunch or afternoon treat, we are confident our customers will taste the difference," said Sandra Stark, vice president, Food Category, Starbucks Coffee Company. Bringing the same passion Starbucks has in serving customers some of the best coffee in the world, the company went back to the kitchen and started from scratch. Starbucks baked and tasted hundreds of recipes to make its food more as nature intended, cutting out all artificial flavors, dyes and High-fructose corn syrup, as well as artificial preservatives wherever possible. "It's great that an industry leader like Starbucks is listening to customers and providing healthier options, while also being transparent about the ingredients in its more indulgent offerings. People want food that tastes delicious, but the definition of 'healthy snacking' is changing. People are asking what goes into their food, not just whether it is low-fat or low calorie," says Keith Ayoob, Ed. D., R.D. at Albert Einstein College of Medicine. Starbucks will also offer additional nutritious options, like a Farmer's Market Salad with all-natural dressing, and a new flavor of its popular line of Vivanno(TM) Smoothies. "Many people do not realize how many hidden calories can be in the average smoothie or restaurant salad. And no one wants to think they're making a healthy choice just to realize they've accidentally consumed half their day's calories on a smoothie. At Starbucks, our salads and smoothies were designed to deliver real nutrition and great flavors at a sensible calorie level. Our two salads are 250 and 300 calories with dressing and our new Strawberry Banana Vivanno Smoothie provides 15 grams of protein, 7 grams of fiber, and 100% of your daily Vitamin C - at just 280 calories," said Katie Thomson, registered dietitian and senior nutritionist, Starbucks Coffee Company. Starbucks has made a long-term commitment to providing options for a healthier lifestyle. The company will continue to review its nutrition and food and beverage offerings to make it easier for customers to make better choices in Starbucks stores. Nearly half (48%) of Americans would drop their mobile data plans completely if they had to cut household expenditures, according to a new study by Strategy Analytics. At the same time, only 10% would drop their home broadband subscription. Ben Piper, director of Strategy Analytics' multiplay market dynamics service, said in a statement that the technology research firm wasn't surprised that consumers placed a high value on home broadband. "What surprised us was the vulnerability of mobile services," he said. Under the same expense-cutting scenario, 12% of Americans said they would drop their pay-tv service completely, while 41% would scale service back to a lower tier. Fifty-six percent would make no changes to their home fixed voice service, compared to 51% for mobile voice. "These results suggest that while American consumers consider home broadband service to be a vital utility, they see mobile data service as simply a 'nice to have,'" noted David Mercer, vice president of Strategy Analytics' digital consumer practice. The layoffs keep coming at News Corp. interactive units. Just a week after MySpace announced plans to cut its workforce by 30% -- or roughly 425 employees -- Fox Interactive Media unit Photobucket has let go a third of its staff -- or some 35 workers. The cuts, first reported by industry blog BoomTown, will affect roughly 75 FIM employees -- the remainder of whom resided at various other divisions of the News Corp. unit, including its IGN video game and entertainment division. "As part of our continuing review of each of the FIM business units, employees were informed of job cuts today at several of our sites," according to an FIM spokesperson. "We made these cuts to ensure that our resources are aligned properly with our business goals, and at a scale that will enable us to operate as efficiently as possible." Last week, the "restructuring" plan at MySpace crossed all U.S. divisions of the News Corp.-owned social network. "MySpace grew too big considering the realities of today's marketplace," said Jonathan Miller, News Corp.'s CEO of Digital Media and chief digital officer. The move marked MySpace CEO Owen Van Natta's first major move since replacing MySpace co-founder Chris DeWolfe in April. "Simply put, our staffing levels were bloated and hindered our ability to be an efficient and nimble team-oriented company," said Van Natta. Largely in an effort to bolster MySpace and its other Web properties, News Corp. paid $250 million for Photobucket in May 2007. Then best-known for helping users post images on MySpace member pages, Photobucket rose to prominence as a one-stop shop for uploading digital pictures and videos online. Yet, as MySpace's star has fallen over the past year, Photobucket's has inevitably followed. Today, social media king Facebook has over 200 million users, compared with MySpace's 130 million, according to comScore. COMMENTARY: The layoffs at Photobucket do not surprise me in the least. So many places to store and share photos on the WWW. Last week News Corp announced a layoff of 30% of its labor force, then followed this up with a 300-person layoff overseas. Now Photobucket. Jonathan Miller, CEO, Digital Media at News Corp really has his work cut-out for him. If it were me, I would just shutdown Photobucket. It is a dinosaur. Days after unveiling a major digital advertising alliance with Microsoft, Publicis reportedly is discussing an even bigger deal with the software and digital publishing giant that would make it the undisputed leader in the interactive advertising services industry. Microsoft has retained investment banker Morgan Stanley to find a buyer for interactive services shop Razorfish, and Publicis is a leading candidate, reports the Financial Times. Microsoft acquired Razorfish (formerly Avenue A/Razorfish), as part of its $6 billion acquisition of digital agency holding company aQuantive in 2007. Microsoft has rapidly integrated most of the publisher-facing components of aQuantive's assets, including ad server Atlas, but has maintained an arms-length approach to Razorfish. While ownership of a major digital agency has helped inform Microsoft about the needs of advertisers and agencies, Microsoft executives have maintained that the agency has effectively operated autonomously since the acquisition, raising questions about its long-term fit within Microsoft. Razorfish is one of the world's largest free-standing interactive advertising shops, and its acquisition by any of the major agency holding companies would alter their rankings in the digital services sector. According to RECMA's most recent interactive agency report, Razorfish ranks as the fifth largest interactive agency in the world with a global workforce of 1,960 people, just behind Publicis' Modem/Dialog organization, with 2,100 employees. With an organization of 3,800, WPP's Ogilvy Interactive unit currently is the industry's largest, and has helped give WPP bragging rights as the biggest digital advertising services holding company in the world. WPP chief Martin Sorrell and Publicis chief Maurice Levy have been especially competitive in their claims of digital marketing services dominance, and Publicis' acquisition of Razorfish would clearly tip the balance sheet in Levy's favor. Citing unnamed analysts, the Financial Times estimated that Razorfish could fetch as much as $700 million for Microsoft. Some of Razorfish's top clients include Kraft, Nike and Audi. For Microsoft, the timing of a divestiture of Razorfish may make sense. The company has accomplished much of what it set out to achieve with its acquisition of aQuantive, amassing a critical mass position in the digital advertising marketplace. "Microsoft has now grown an advertising business in excess of $2 billion and that's a big number for our company, a big number, and we're very serious about it," Microsoft CEO Steve Ballmer said during a keynote at the Cannes advertising festival in France last week. During the Cannes festival, Microsoft announced several advertising alliances with agencies, including a multi-tiered deal with Publicis that includes development of both digital content and a customized online ad exchange. Under the arrangement, Microsoft will back a production pipeline from the Publicis-owned PBJS studio -- with the holding company's clients having the first opportunity to attach advertising to the content. Publicis' VivaKi Nerve Center will also be involved in production strategy. Microsoft will be damn lucky, very lucky if they can fetch $1 billion for Razorfish in today's turbulent economic times. Even though ad dollars have migrated from traditional media to the Net, ad budgets have also been slashed by advertisers. The last time Razorfish suffered through an economic downturn was during the 1998 DOTCOM bubble when it lost two-thirds of its billings. I was there, and thought Razorfish was God-l;ike, the best damn interactive agency, and even they took a huge hit. Red Mango Inc. is looking to add some toppings to a new round of funding as potential franchisees turn to the frozen yogurt chain amid recession-related unemployment woes. A regulatory filing shows the company has secured $1.2 million of a round targeting $8 million. Chief Executive Dan Kim confirmed the company is seeking $8 million, but declined to say how much has been secured to date. Founded in 2002 in South Korea, Red Mango opened its first U.S. store in July 2007 in Los Angeles and has since grown the operation to 54 stores. Kim said the company will expand to 70 stores by the end of the year and will add 100 more in 2010. Kim said as the number of stores grows, there’s a greater need for marketing and franchisee support, which is what the new round will fund. The company also recently moved its headquarters from Sherman Oaks, Calif. to Dallas. As of March, a study of 13 Red Mango stores showed an average annual income of $500,000 with the most successful grossing $800,000. The company’s $12 million Series A round was led by Dallas-based investment firm CIC Partners and retail executive John Antioco. 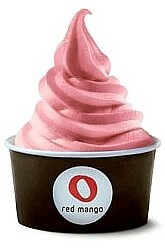 Red Mango previously raised about $4 million from Stone Canyon Venture Partners and individual investors. Red Mango’s largest competitor is Los Angeles-based Pinkberry Inc., which announced in April a $9 million round of funding and plans to expand in the Middle East as part of a 35 store expansion in nine countries. Pinkberry has raised at least $36.5 million from investors including venture capital firm Maveron. COMMENTARY: Having consulted for various frozen yogurt clients, I just enjoy watching Red Mango and Pinkberry go at it to capture a larger share of the U.S. frozen yogurt (FRO-YO) market and eventual dominance. I am not overly impressed with the average annual income per store of $500,000, given the cost of renting retail space and operating a fro-yo business. Of greater concern is just how many fro-yo establishments some markets can support. Some metro markets are already over-saturated with fro-yo shops. The majority of fro-yo customers are asain, no two ways about it, and I am wondering whether either Red Mango or Pinkberry, or any other fro-yo shop, can survive surving on dominant customer demographic. Finally, is the fro-yo craze going to fizzle-out? The fro-yo industry has experiencved booms and busts at least two or three previous times, and this is one is the latest.